Metacarpal fractures are common hand injuries. They can occur from a variety of injuries such as a fall, a motor vehicle collision, or punching a wall. There are five metacarpals — one for each finger and the thumb. The metacarpals contribute to the bony architecture of the hand. 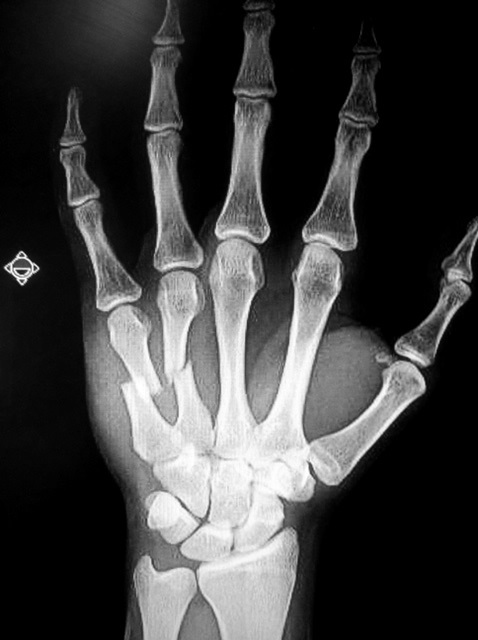 Satisfactory healing of this fracture is important to restoring overall hand function. 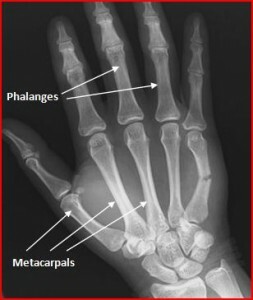 A fracture of the metacarpal neck of the small finger is sometimes called a “boxer’s fracture” as they can be seen in punching injuries. “Fracture” is simply the medical term for “broken bone.” The image below demonstrates a shaft fracture of the 5th metacarpal bone. The treatment plan will depend on the severity of the fracture as noted on the x-rays and the patient’s medical condition, activity level, and desires. Most people have fractures which are well-aligned, and, therefore, do not require surgery. Treatment in these cases is typically rest and protection in a cast or brace for 4-6 weeks. Follow-up x-rays are obtained in clinic to evaluate how the fracture is healing. Some fractures can be re-aligned with manipulation (without surgery) called “closed reduction”, and those patients can also be treated non-operatively. Some patients have fractures which are more severe and the alignment of the fracture may not be satisfactory. Depending on the patient’s health and activity level, surgery may be advised to improve and maintain the alignment of the bones. What can patients do to improve the outcome? Adequate nutrition is important during the healing and recovery process. I recommend a diet rich in protein and calcium and an adequate intake of calories per day while your body is healing. If you smoke, this is a good time to quit. Reducing or eliminating tobacco will improve your healing potential and decrease your risk of delayed healing nonunion, and infection. The natural tendency of the hand after trauma is to become “stiff.” Once the fracture begins to heal, I recommend that patients start to perform range of motion exercises, usually guided by hand therapy. The surgery is usually performed on an outpatient basis using regional anesthesia and sedation. During the surgery I improve the alignment of the fracture and use an implant to stabilize the pieces. In some cases, I use a small metal plate and screws to fix the bones internally. This is called “open reduction and internal fixation” and requires an incision in the hand. In other cases, I use temporary pins to hold the fragments aligned while they heal. This is called “closed reduction and percutaneous pinning.” The pins can be removed in clinic after a few weeks. Which technique is used depends on the fracture pattern and is often determined in the operating room. Surgery does not actually “heal” the fracture; it simply allows the bones to be held in good alignment while the body bridges the fracture site with new bone. This healing process takes a few weeks. Rest and elevation of the hand to the level of the heart is very import for the first few days after surgery to reduce swelling. The first few days after surgery can be quite painful, and medications will be prescribed to help. These medications should be weaned as the pain subsides. Your wrist and fingers will be protected in a plaster splint after the surgery. The splint will be removed in clinic after a few days and a removable splint will be provided. At this point, most patients can begin gentle wrist and finger range of motion with the oversight of a therapist. 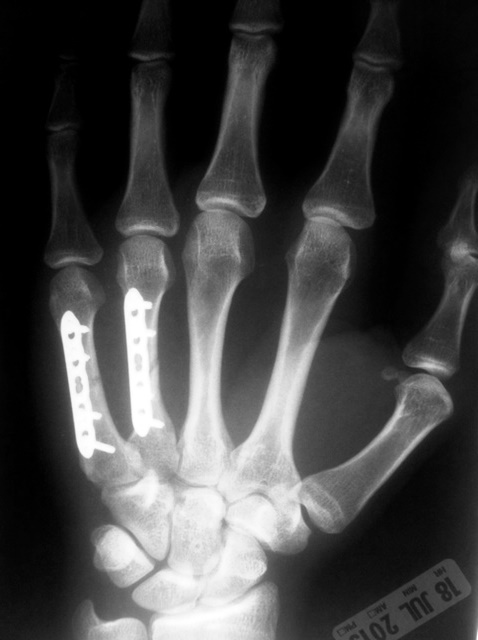 I recommend avoiding heavy use with the hand until the fracture heals, approximately 6 weeks after surgery. Pain, swelling, and stiffness gradually improve over time. Most patients can return to more normal function at about 2-3 months post-operatively, but maximum improvement can take several months. Recovery time varies among patients, depending on the severity of the injury, possible complications, and pain tolerance of the patient. My goal is to help each patient obtain the most function possible after the injury. Images below are from a patient with 4th and 5th metacarpal shaft fractures in the hand. The fractures were displaced and unstable, requiring surgery to improve the patient’s hand function. ORIF with plates and screws was performed.